Had two nights in the ancient camper in Burton-in-Lonsdale and it's a beautiful little village. It has a church, a pub, an amazing (and only local shop - try the cakes!) a castle (sort of! ), a river, and some fabulous views. Touted as the last village in Yorkshire, it is indeed very close to "the border" with Lancashire. The main street in Burton. The road on the left goes down to the river. I am standing outside the village shop. The weather was fine when I walked into the village. Soon found All Saints Church and the memorial outside, fortunately a member of the church was inside and he told me lots of interesting stuff about the village and the church’s origins. Had it not been for him I would not have found the sole war grave in the cemetery. I am indebted to you! These are the first photos, with the inscriptions, more to follow. This Tablet is 29516 in the War Memorials Archive. The cross is 29516 in the War Memorials Archive. He was the son of John and Margaret Young; husband of Margaret Ball (formerly Young), of 21, Fernley Rd., Birkdale, Southport. He was a member of the Duke of Wellington's Regiment (West Riding) 2nd/6th Battalion. He was 30 when he died. According to Ancestry John Young died at home. Whether he was stationed locally I do not know. The 2nd/6th was formed at Skipton in Craven in September 1914 as a home service ("second line") unit. This unit was considered a member of the Territorial force. It seems unlikely that this soldier had ever gone abroad to fight. The extract below is from the Duke of Wellington Regiment Website"
"1 March 1915 : came under orders of 186th Brigade in 62nd (2nd West Riding) Division. Moved to Thoresby Park (Ollerton) in May 1915. Moved in October 1915 to Retford, November 1915 to Newcastle, January 1916 to Salisbury Plain, June 1916 Halesworth, October 1916 to Bedford. Landed in France in January 1917." 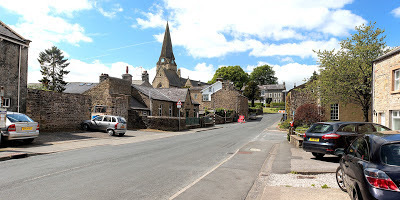 Turn off the A58 and go to WADDINGTON!